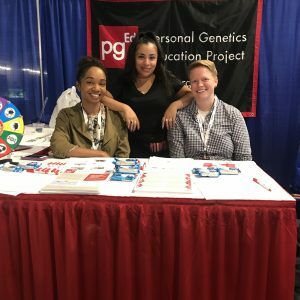 This year pgEd had the pleasure of attending the annual National Association for Biology Teachers (NABT) conference in San Diego, California. Three of our team members presented a lesson on genetic technologies with a focus on the ethical, social and legal implications of the new CRISPR technology. The room was packed with teachers from across the country enthusiastic about CRISPR. Our session – and specifically our interactive “four corners” activity attracted many different points of views that reflected a larger society ofopinions. PgEd was also lucky enough to be able to connect with more teachers through our booth. Hundreds of teachers were given free PgEd material and a krispy CRISPR treat! One of the most moving moments was when teachers who have been using our material expressed how impactful our material has been in their classrooms. We honor the sustainable relationships we are able to create with teachers for they are the ones on the ground with the next generation of leaders. If you have not yet joined our mailing list, please do!